Microwaves are now commonplace in American homes, prized for their convenience. Using electromagnetic energy, microwaves heat or cook foods ranging from vegetables to canned soups to meat. The primary factors in retaining nutrients when using a microwave are short cooking times and little added water. According to Harvard Health Publications, certain nutrients, such as vitamin C, will break down when exposed to heat, regardless of whether you cook using a microwave or through more conventional methods. However, because microwaves cook foods quicker, they may actually do a better job of preserving nutritional content that can be destroyed as a result of high heat exposure. Nutrients are also better preserved when minimal amounts of water are used during cooking. To further preserve the nutritional content of vegetables, Columbia University recommends not peeling the vegetables and using large pieces. Cover the foods so they steam during the cooking process, further reducing the cooking time. The amount of water you use to cook foods, namely vegetables, in the microwave has a great impact on the number of nutrients lost. Some vitamins are water-soluble, so they leach out during water cooking methods, such as boiling or poaching, including using water when cooking in a microwave. All the B vitamins and vitamin C are water-soluble. Many minerals in foods are found in the form of mineral salts, which are also water-soluble. Using minimal amounts of water or consuming the cooking liquid -- as in the case of soups, stews or gravies -- will ensure you get the full nutritional value of your foods. According to CSIRO, the Commonwealth Scientific and Industrial Research Organization of Australia, proteins, fats and carbohydrates are not greatly affected by microwave cooking. However, long cooking times, especially at higher temperatures, can cause protein to denature, when the protein molecules begin to unfold and extend, a process that occurs in all cooking processes, not just with microwaves. CSIRO states that the quality of cooked proteins is generally higher than with conventional cooking methods as there is less oxidation and gentler heating, leading to greater retention of nutrients in general. However, these effects are considered nutritionally negligible. One of the primary concerns with microwave cooking is possible radiation leakage and chemical leakage from cooking containers. Because microwave cooking requires high bursts of energy, only some containers are microwave safe. Cooking with unsafe containers could lead to carcinogenic toxins leaking into your foods. Similarly, many are concerned with the small amount of radiation leakage that occurs with microwaves, although the U.S. government has deemed the amount to be “insignificant.” However, these two concerns do not directly affect the retention of nutrients in foods cooked in microwaves, and no scientific evidence supports the dangers of cooking with microwaves if the ovens are in good condition. 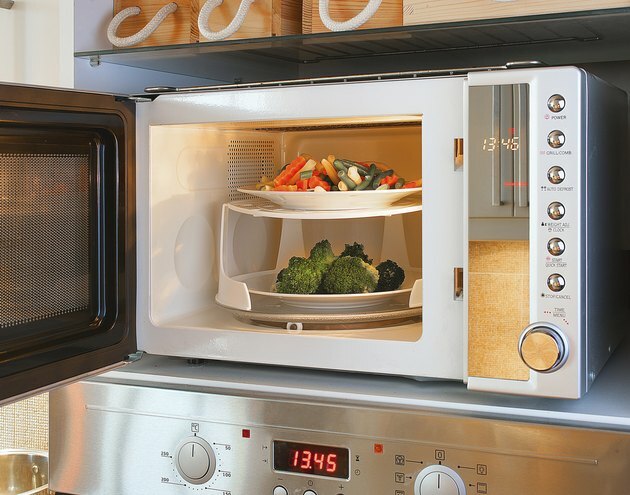 The Kitchn: Fact or Fiction -- Does Cooking Vegetables in the Microwave Destroy The Nutrients? Mercola.com: Why Did the Russians Ban an Appliance Found in 90% of American Homes? The Science of Cooking: When You Beat Egg Whites, Does Denaturation Occur? Go Ask Alice! : Microwave Ovens Decrease Nutritional Content of Food?